Belegarth • View topic - Huh? Helm? Doesnt count as a full metal helm, and why it's "safe". I must completely not understand the intent behind the ban on full metal helms if this example would be passed. That helm looks to me to be extremely capable of delivering substantial damage if the wearer were to charge an opponent, which was, I thought, the intent behind banning full metal helms. It's not a FULL metal helm because it doesn't cover the face. Full helms cover the whole face and head, like an SCA helm, which is what they are trying to kep out in the rules. I will agree that this helm is as close to being a "full metal helmet" as I would allow. But technically is still isn't and passes. The ban on full metal helmets are there for a number of reasons. The big one, in my opinion, was to prevent SCA helms being allowed. There have been other reasons on why people feel that they should be banned citing safety concerns (what happens if the helm falls on someone because they're heavy, or what if we need to get the helm off if they're sufficating), but none of their agurement have ever convinced me that there is genuine safety issuse. Here is a picture of a metal helm that was allowed (Yes, it's Dominus and it's a Dagorhir picture). Here is another metal helm that is allowed. Okay. I still dont understand all of the intents of this rule, but I at least have the right information to think about now. I think I remember Dom's helm failing by that rule. That rule wasn't in place when that picture was taken. I don't know about Kegg's. I remember the argument having something to do with rigid neck and cheek pieces extending from the skull cap. Anyway, I think the rule is terribly vague the way it is currently worded and probably does little to improve helm safety. ONLY question I had about the helm was the top part. It looked somewhat pointy. Rounded/pointy, but I would want to make sure it would pass like a pommel would pass. Other than that, I would say it's legal, so I'd pass it if I was checking it. The only reason I ever remember his helm failing was for 1/2" protusion. He had replaced the metal Aventail with a leather one. That picture, I believe, is from Ragnarok 16 and the helm rule was voted in at Ragnarok 14. Raban championed it I believe as well. I don't remember there being complaints about the cheekplates. At Armageddon 1, when Kegg rewrote the rules, he tried to get full metal helms (ie great helms) to be legal. Owen crusaded against it, citing safety concerns. I feel that we allow more thing that are more dangerous then a full metal helm and we don't even question them. I simply don't think that full metal helm is as dangerous as other make them out to be. I personally would have no problem supporting full metal helms being allowed. This is another discussion we can have in the next couple off months once we have finished the issues that are on the table currently. Regarding the pointyness of the top, it's still penny rounded, and the angle it forms is greater than 90 degrees, so it's actually safer than the standards for, say, the shoulders of a metal lorica segmentata. Most solid plate armor would have something on it that would fail a pommel test. Thing is, the point is 6'+ up in the air and aims upward. Ok, it just looks a LOT pointier in the picture. So you're saying that, If I chose, I could wear a metal roman helm on the field, so long as the cheeks plates and back plates were leather? I, as a weapons checker, would pass it aslong as you had nothing covering the face. okay, how about a steel-backed nasal and cheek plates? they'd be padded with sheepskin and covered with armor grade leather. I'm just thinking of ways to protect my nose from getting busted again. Keoma stepped outside and found it was too cold. So she bade the sun rise and then cursed, "Sh*t! Now it's too bright!" That brings up a good question...what of leather covered steel? I'm assuming illegal, but please correct me if I'm wrong. Ant thoughts yet? 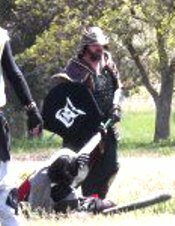 i want to get my helmet BEFORE i go to beltaine and put my nose at risk for another breaking. The purpose of the rule is that it was felt that people in full, strapped SCA helms are pretty much immune to any head damage. That they will then somehow fight in an unsafe manner if not worried about their noggin. Also, Belegarth legal metal helms are rare. If you allowed SCA helms in, they would become much more common (and have a increase in helm/non helm head collisions). Sort of like if one guy hand maded a Avon Maille shirt everyone would say awesome. Once they became commom every one said - Ugh. As Winfang says, I see no problem with an otherwise safe helm and pushed to allow period SCA helms. BTW... My metal helm in the picture shown has never failed any weapon check. If a helm fails in the SCA due to face concerns, it probably will pass. Weapon checkers on an almost full helm are going to be very critical off all other parts of it (penny round, points, etc.). I would expect yours would pass. I'm waffling back and forth between having the face protection attached, or getting a separate face mask like a menpo or something. I really hate faceshots, if you can't tell. the one i had in mind was from wolfgaard armory. the mercenary. simple, straightforward, and protects the cheeks and nose from being bopped. I have a question. I came into a group of viking ocular helms made of metal... are they legal. They are metal spangenhelms with ocular. The sides back and jaw are exposed. Personally if it is a period helm, even a full helm, and someone wants to wear it on the field of battle, let them. It is more weight, hard to see out of ( did 8 years in the meridies ) and just annoying when someone is lighter and faster than you. As long as the FULL FACE is not covered (I'd say 80-90% protected), then it would pass under this rule. However, I also do not like the idea of full-face helms, period or not. I've had a couple of face-to-face collisions and I could see someone becoming SERIOUSLY injured by slamming face-first into even a thin steel wall.